There were 42 award trophies and 39 highly commended notables at this year’s AC&E Awards, held at the Big Top at Sydney’s Luna Park on 26 October and attended by 500 industry professionals. Clemenger BBDO Melbourne took out the most awards handed out to one agency in one sitting, scoring 10 awards plus three Pinnacles including the Courageous Client Award and the Grand Prix. Many of these were for its ‘Meet Graham’ campaign, produced for the Transport Accident Commission. The interactive sculpture and education message is based around demonstrating how humans would need to change or evolve in order to survive the impact forces of a 30km/h car accident. Clemenger also received four awards for its ‘Snickers Hungerithm’ campaign, produced for Mars Chocolate Australia including the newly launched Pinnacle Award for Data-Driven marketing. In addition, the agency picked up the Ecommerce Website and Marketing award for the Myer ‘Six Second Sale’. Other data-driven winners on the night included Ogilvy Australia’s ‘AAMI SmartPlates’ learner driver mobile offering for Suncorp/AAMI, which won best Data Strategy and Mobile Marketing; Woolworths Rewards customer loyalty program for ‘Stealing Santa to Create an Email Personalisation Revolution’, which secured Data Analytics and Planning; and LIDA Australia, for the Lexus Australia ‘Finding the 100’ campaign, which won Data-Driven Mail. Across the Excellence categories, Tully and Mercer were joined by James McGrath from Clemenger BBDO, who took out ADMA Creative of the Year; Shannon Clarke from iSelect (ADMA Young Marketer of the Year); Marina Vasilieva from McCann (ADMA Young Creative of the Year) and Jo Whyte from City of Melbourne (Jon Clark Award for Outstanding Contribution). All of this year’s AC&E Awards were audited in ensure to ensure the validity of the effectiveness claims, a decision which saw ADMA’s Audit Committee join forces with the Audit Media Association. 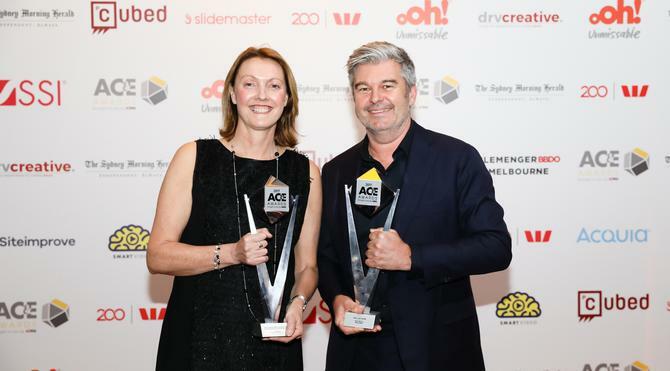 “The AC&E Awards matter enormously to clients and agencies today because they’re the only awards in Australia that recognise exceptional creativity and solid business results in equal proportion, not as separate specialisations,” ADMA CEO, Jodie Sangster, said. During the presentations, Sangster also confirmed entries for the 2018 edition of the AC&E Awards will be free to ADMA members.